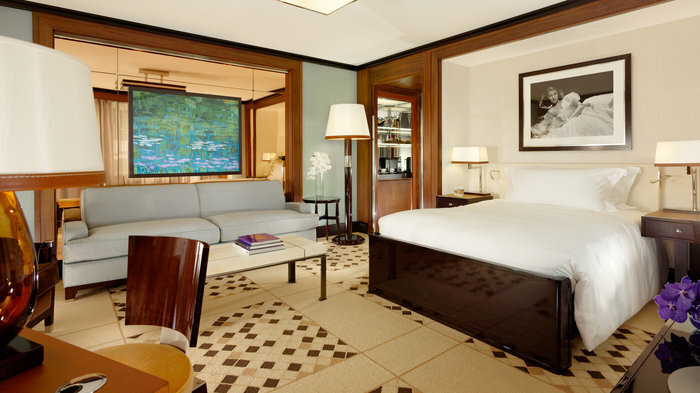 Sister hotel to The Dorchester, 45 Park Lane houses just 45 rooms and suites, making it an intimate accommodation option. It also houses Wolfgang Puck's renowned steak restaurant and a stylish bar that boasts the UK's largest selection of American wines. Designed by Thierry W. Despont, this small hotel is the ultimate in comfort and luxury. Just down the road from sister hotel The Dorchester, 45 Park Lane is the new kid on the (very exclusive Mayfair) block. Opened on 1 September 2011, the small hotel - with just 45 rooms and suites - has been designed for comfort and luxury by internationally acclaimed architect and designer Thierry W. Despont who has used art deco as a leit motif. Just across the road from Hyde Park, the views are leafy and green and only get better the higher - and more costly - you go. The panoramic views from the wraparound terrace of the Penthouse Suite are nothing short of spectacular. Most exciting, especially among meat lovers, is Wolfgang Puck's steak restaurant, CUT at 45 Park Lane, where you can dine on the best steak money can buy while surrounded by Damien Hirst's 'Psalms'. Art is a feature of the hotel with original works by leading, living British artists in every bedroom. Each room also includes an iPad, and a yoga mat with yoga instruction accessible via your flat screen television. Guests can also use the Fitness Studio on the first floor, open 24 hours a day, or take up the offer of complimentary access to The Dorchester's more extensive spa. Additional public areas include Bar 45, a residents' Library and a private Media Room where you can watch private screenings from the comfort of a well padded armchair. A classic steak restaurant from Austrian-American chef Wolfgang Puck. If you've never heard of Wolfgang Puck you're clearly from this side of the Atlantic. The Austrian-American chef is a household name in the US and he has chosen London as the city to launch his first European restaurant. The CUT at 45 Park Lane, housed within the Dorchester Collection's new Mayfair hotel, 45 Park Lane, is his fourth such restaurant and follows the same formula as the original and award-winning CUT in Beverly Hills. Puck's 74-seat London steakhouse places an emphasis on grilled food. The menu offers "contemporary interpretations of the classic steak restaurant" with Puck's signature cuts of beef including filet, sirloin, ribeye, rib-chop, Porterhouse, bone-in New York and bone-in filet. Guests can also sample an extensive array of seafood and salad dishes such as the pan roasted Scottish lobster with black truffle sabayon and Heirloom tomato salad with Neal's Yard goat curd and aged balsamic. For pudding, a collection of traditional British and American favourites include baked Alaska and banana cream pie. And there's a first for a CUT restaurant: a breakfast menu, featuring blackberry buttermilk pancakes and salt beef hash cake. If that isn't enough to make Wolfgang Puck a household name in Britain maybe his extracurricular activities will: he's the one voicing the chef in The Smurfs, the film. A stylish bar with the UK's largest selection of American wines. Located above the hotel's restaurant, CUT, Bar 45 is a stylish cocktail bar that's ideal for a sophisticated evening sipping on cocktails. The décor is sleek, with polished wood and leather fittings, and the drinks menu is suitably indulgent. The cocktail menu boasts a number of unique options, including Smoke & Mirrors, with lapsang souchong infused single malt scotch, Drambuie, cherry morlacco and lemon; Crouching Tiger, with jasmine flower green tea infused vodka and lemon juice; and Forbidden Kiss, with gin, fresh raspberries, rose elixir and lemon juice. The bar also boasts the largest selection of American wines in the UK and a bar menu of 'Rough CUTS' by Wolfgang Puck, featuring mini kobe sliders and house smoked pastrami Rueben sandwiches. Guests at 45 Park Lane are invited to use the spa at sister hotel, The Dorchester. Consistently voted the top hotel spa in the UK (and who are we to disagree with the exacting standards of Conde Nast Traveller readers), The Dorchester Spa really is something special. A £3.2 million expansion of The Dorchester hotel in 2009 saw the spa undergo a makeover by Fox Linton Associates with 1930s touches - like the chrome doorway that gives you your first impression - and a centrepiece chandelier made of 75,000 South Pacific pearls. The Spa features nine tranquil, sound-proof treatment rooms including two double suites, a manicure and pedicure suite and relaxation room, a hairdressing salon and gentlemen's barber as well as a fitness studio. Unusually, and uniquely, for a spa there's also an informal 'Spatisserie' dining room where you can enjoy a light lunch, afternoon tea with (gasp) cakes, biscuits and pastries - a radical departure from the purify-and-purge philosophy of most spas. You can even indulge in a glass of pink fizz, or a Spa Kiss cocktail with elderflower and English sparkling Nytimber. Treatments cover the full range of face and body treatments with four 'expert partners' to choose from including signature facials by Vaishaly - whose Marylebone salon is frequently by celebs like Elle Macpherson and Sophie Dahl - Carol Joy London, European skincare brand Kerstin Florian, and acclaimed British brand, Aromatherapy Associates. From cheap budget hotels to luxury 5 star hotels see our deals for hotels, including Grange Blooms Hotel London from 57% off.